Discovery Preschool & Childcare Center, Inc. Discovery Preschool & Childcare Centers, Inc.
" A place to learn, play, explore and discover the world." Thank you for visiting our website. Please call to arrange a tour of the facility you are interested in attending. While we have an open door policy for our families, we will not accept drop in tours at this time. Please call or email to arrange a tour, to ensure proper staffing in the classrooms and so that someone is available to answer all of your questions. Video of new BEAM Interactive Projector at South Ave location. Classroom space now available for Birthday Party Rental. Awarded an extended 2 year license for both facilities in 2017. Featured facility in the 2010 Missoula Parade of Child Care Providers. Our South Ave facility is licensed for 45 children ages 2 months to 6 years old. Our Brooks Ave facility is licensed for 60 children ages 2 months to 5 years old. This Center opened Jan. 2016. Please Note: Some children will thrive in a family or group home childcare environment, while others do well in a larger Center environment. When choosing your child care facility this is an important consideration to make. Ask questions and carefully consider all options before choosing a Childcare Provider. Communication is very important between a provider and families. Discovery Preschool is a licensed Center for children ages infants thru 6 years old. Our Mission is to provide children with a safe and nurturing learning environment and varied experiences which help them develop socially, intellectually, physically and emotionally in a manner that is age-appropriate. Our South Ave facility provides four separate classroom spaces- a Infant/Toddler Room, 2-3 Year Classroom, and two Preschool classrooms for children ages 3-5 years old. There are two playground spaces with developmentally appropriate structures and equipment. For additional information please see "Our Program" page. Downloadable parent information on "Staff and Rates" page. Our Brooks street location, began in January 2016, and currently has an infant room, Waddler classroom, 2 year class, and 3-5 classroom. We offer arts experiences that are open-ended, creative movement, creative ballet, and music experiences, and Zoo Phonics is introduced in the Preschool classrooms. Our food program introduces children to foods from around the world. Our theme-based curriculum integrates a variety of arts and cultural experiences for preschoolers. We provide both full time and part time childcare to our families. 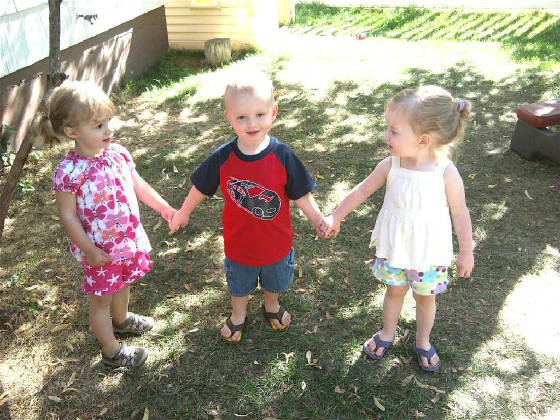 For the majority of our children, we provide a preschool experience in a full day child care setting. We have been licensed through the state of Montana since 2005 (South Ave location). We focus on and work toward achieving the guidelines and standards of the NAEYC (National Association for the Education of Young Children), however we are not accredited through the NAEYC. each to fulfill his/ her potential. * The United States Department of Agriculture (USDA) prohibits discrimination in its programs and activities on the basis of race, color, national origin, gender, religion, age, disability or political beliefs. Persons with disabilities who require alternative means for communication of program information ( Braille, large print, audiotape, etc) should contact the USDA Target Center (202) 720-2600. * To file a complaint of discrimination, write, USDA, Director, Office of Civil Rights, Room 326-W, Whitten Building, 14th and Independence Ave. SW, Washington DC 20250-9410, or call (202) 720-5964 (voice and TDD). USDA is an equal opportunity provider and employer.